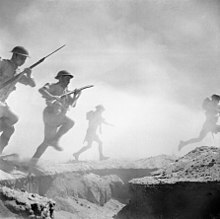 24 October 1942: British soldiers on the attack. The Second Battle of El Alamein was a great turning point in the Western Desert Campaign of the Second World War. The battle lasted from 23 October to 5 November 1942. The First Battle of El Alamein had stopped the Axis from attacking deep into Egypt further. Thereafter, Lieutenant-General Bernard Montgomery took command of the British Eighth Army in August 1942. In the second battle he took the offensive, with great success. The Allied victory turned the tide in the North African Campaign. It ended Axis's hopes of occupying Egypt, taking control of the Suez Canal, and reaching the Middle Eastern oil fields. The battle forced Erwin Rommel and his Afrika Corps to retreat back to the former French fortifications in the Mareth Line in the border between Tunisia and Libya. ↑ 1,029 tanks were ready for action at the start of the battle, this figure consisted of: 170 M3 Grant and 252 M4 Sherman medium tanks, 216 Crusader II and 78 Crusader III cruiser tanks, 119 M3 Stuart (also known as "Honey") light tanks and 194 Valentine Infantry tanks. There was also 200 tanks available as replacements and over 1,000 tanks were in various stages of repair, overhaul or being modified within workshops. ↑ There was a frontline strength of 420 fighters, of which only 50 were Supermarine Spitfire and nearly half were Hawker Hurricane. ↑ This figure excludes 54 transport aircraft. ↑ Of which, 554 were 2 pounder anti-tank guns and 849 were 6 pounder anti-tank guns. ↑ In Playfair the estimate for this figure is 104,000 comprising 54,000 Italians and 50,000 Germans including the 19th Flack Division and the Ramcke Parachute Brigade, both Luftwaffe units. In addition there were approximately a further 77,000 Italians in North Africa who did not come under the Panzermee. ↑ 249 German tanks and 298 Italian tanks. Broken down as follows: 31 Panzer II, 85 Panzer III (short 50mm main gun), 88 Panzer III (long 50mm main gun), 8 Panzer IV (short 75mm main gun), 30 Panzer IV (long 75mm main gun), 7 command tanks, 278 Fiat M13/40 variants and 20 Italian light tanks. A further 23 German tanks, that were under repair, have been excluded from the above total. ↑ 68 "7.65cm" (Source possibly means the 7.62 cm PaK 36(r)) anti tank guns, 290 50mm Pak 38 anti tank guns, 88mm flak guns. ↑ 2,350 men killed, 8,950 wounded and 2,260 missing. 58% of casualties were British, 22% were Australians, 10% were New Zealanders, 6% were South Africans, 1% were Indians and 3% were other Allied forces. ↑ Nearly 500 tanks were put of actions during the course of the battle however most were repairable and by the end of the battle 300 had already been repaired. ↑ 77 British and 20 American aircraft. ↑ Barr explains "casualty figures for the Panzerarmee will only ever be estimates given the confusion that reigned amongst its units in the early stages of the pursuit. British estimates, based on intercepts, gave German casualties as 1,149 killed, 3,886 wounded and 8,050 captured. Italian losses amounted to 971 dead, 933 wounded and 15,552 captured. By 11 November the total number of Axis prisoners had risen to 30,000 as more were netted during the pursuit." ↑ On 4 November only 36 tanks were left out of the 249 tanks the Germans started the battle with. Of the 278 Italian tanks around half had been lost. The majority of the remaining Italian tanks were lost the following day in a single engagement with the 7th Armoured Division. ↑ Barr states this figure is the overall number of guns lost and does not break them down between the Germans or Italians. ↑ 64 German and 20 Italian aircraft. This page was last changed on 17 August 2018, at 15:07.